Innovation in light well intervention gains a new name – with the arrival of the PDS. The product deployment system presents a unique solution capable of significantly reducing light well intervention costs. 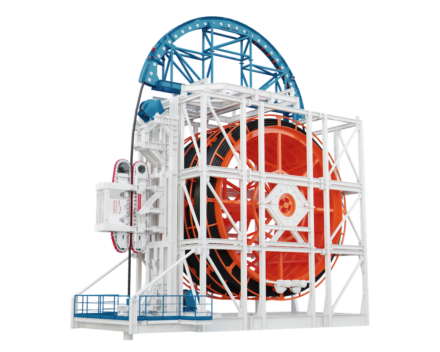 Combined of an integrated reeler and 2-track tensioner, the compact package can operate either as a vertical or horizontal system, depending on the product’s location at port during vessel loading, and on deck during deployment or retrieval. Among its unique handling features, the retractable work platform allows for operations over the moon-pool or the side of the vessel, while a set of initiation winches supports loading the product and handling pipe-end terminations and mid-water connections. As well as product deployment systems, Maritime Developments delivers the full turnkey package of back-deck handling equipment including vertical lay systems, tensioners, reel drive systems, overboarding chutes, spoolers, level winders, compensators and control systems. Our deployment systems are designed and manufactured to comply with PUWER / LOLER requirements and have DNV certification. The control systems are designed for safe, efficient product handling with data logging as a standard feature. This ensures instant access to critical product lay information with the option to record the data which can be accessed during or post operation.